Slide 1 of 20. 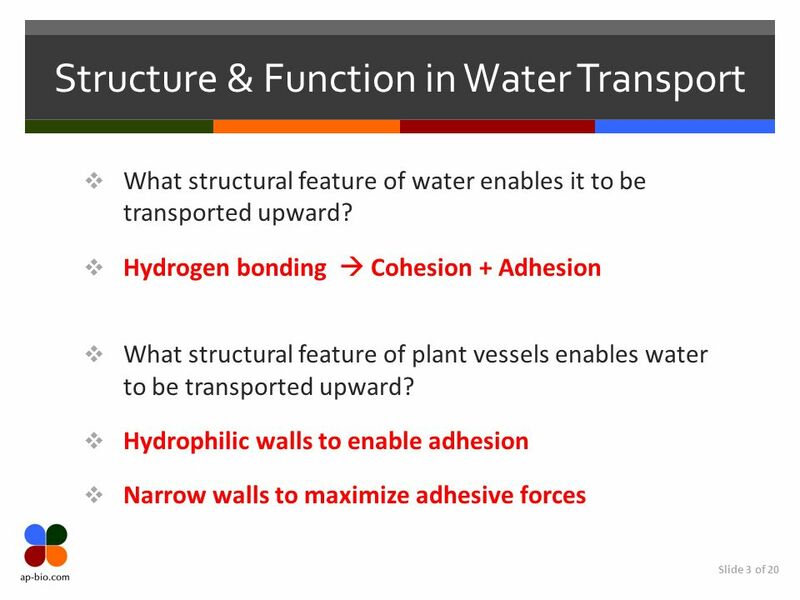 Slide 2 of 20 Structure & Function in Water Transport What structural feature of water enables it to be transported upward? What structural. 2 Slide 2 of 20 Structure & Function in Water Transport What structural feature of water enables it to be transported upward? What structural feature of plant vessels enables water to be transported upward? 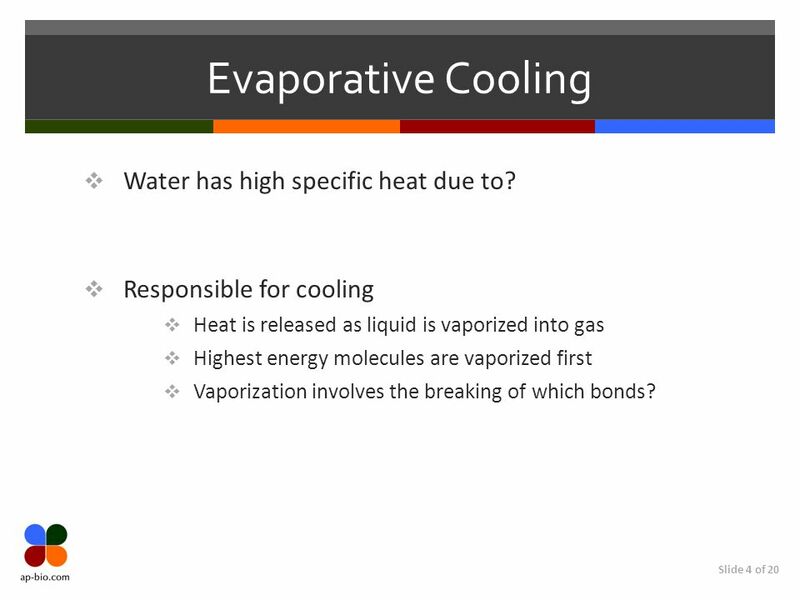 4 Slide 4 of 20 Evaporative Cooling Water has high specific heat due to? Responsible for cooling Heat is released as liquid is vaporized into gas Highest energy molecules are vaporized first Vaporization involves the breaking of which bonds? 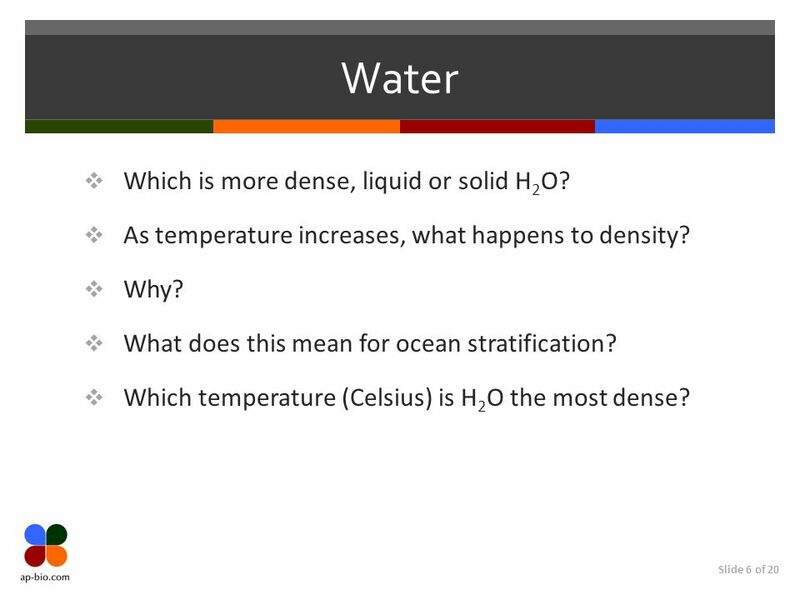 6 Slide 6 of 20 Water Which is more dense, liquid or solid H 2 O? 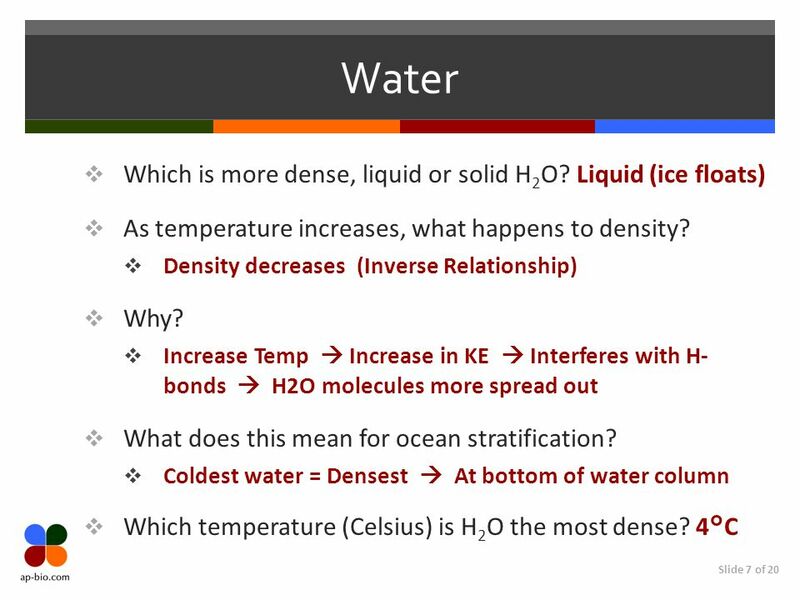 As temperature increases, what happens to density? Why? What does this mean for ocean stratification? Which temperature (Celsius) is H 2 O the most dense? 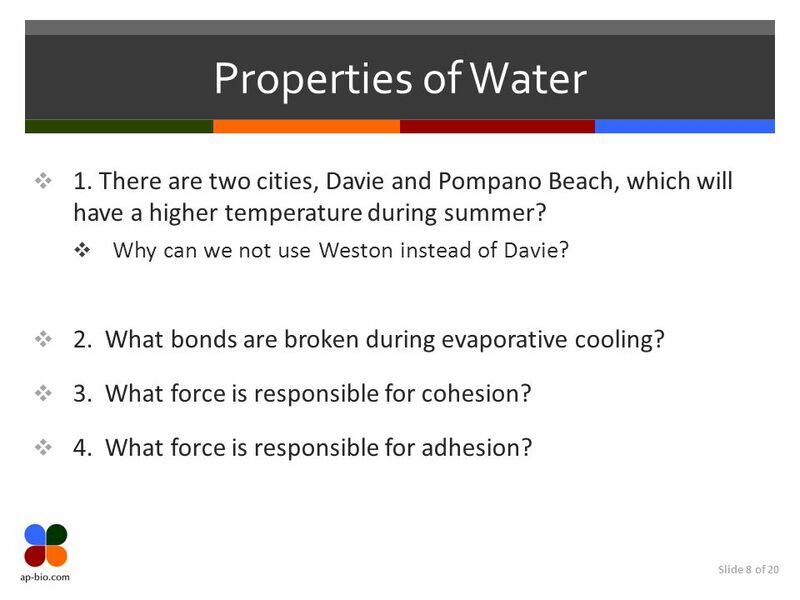 8 Slide 8 of 20 Properties of Water 1. There are two cities, Davie and Pompano Beach, which will have a higher temperature during summer? 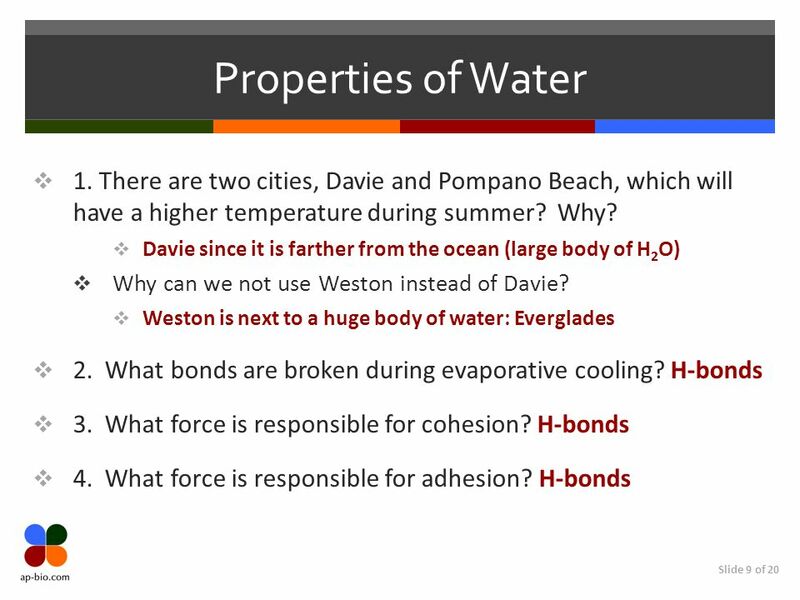 Why can we not use Weston instead of Davie? 2. What bonds are broken during evaporative cooling? 3. What force is responsible for cohesion? 4. What force is responsible for adhesion? Download ppt "Slide 1 of 20. 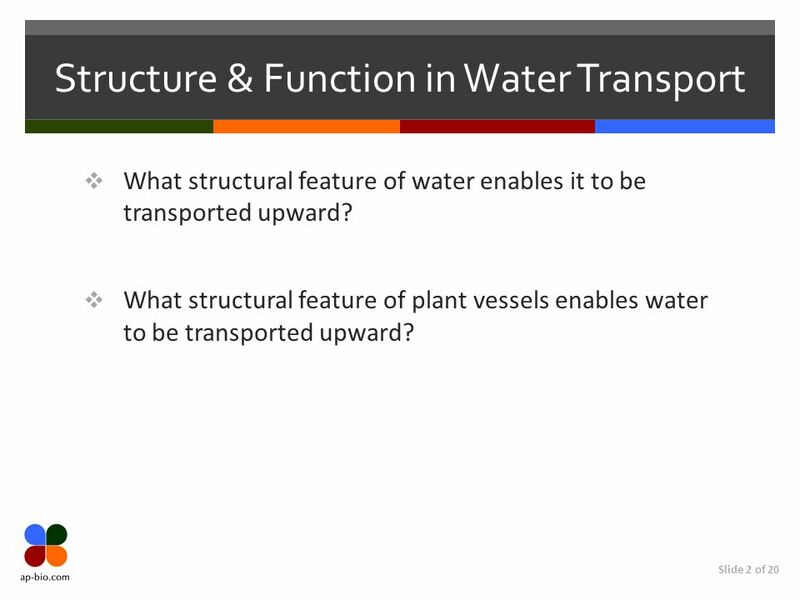 Slide 2 of 20 Structure & Function in Water Transport What structural feature of water enables it to be transported upward? What structural."
? Water =Life. ? Water =Life Why water is so FREAKIN cool: 1. It’s Polarity gives potential. 2. Cohesion/Adhesion/Surface Tension 3. Amazing solvent. 1 Water. Life on earth evolved in water,and all life still depends on water. At least 80% of the mass of living organisms is water and almost all chemical. o C - steam 3 Water consists of an oxygen atom bound to two hydrogen atoms by two single covalent bonds. – Oxygen has unpaired & paired electrons. 1 Water Chemistry All living organisms are dependent on water. The structure of water is the basis for its unique properties. The most important property. M. Saadatian Water 1. Water Water contributes to the fitness of the environment to support life. Life on earth probably. 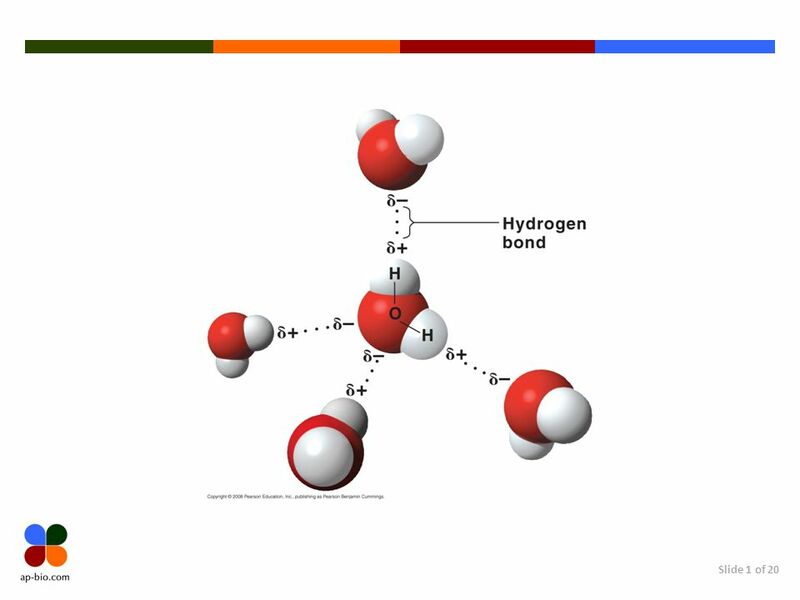 Structure of water Oxygen and hydrogen of water is covalently bonded to create a stable molecule. Water is polar because the oxygen region is slightly. Earth- the Water Planet About 71% of the Earth’s surface is covered in water Without water, life cannot exist Water has unique properties that enables. DENSITY & SPECIFIC HEAT OF WATER.  SPECIFIC HEAT – AMOUNT OF HEAT ABSORBED OR LOST FOR 1 GRAM TO CHANGE THE TEMPERATURE BY 1⁰C  WATER HAS A HIGH SPECIFIC. Chapter 13.1 Objectives Demonstrate the uniqueness of water as a chemical substance. Demonstrate the uniqueness of water as a chemical substance. Model. Why are we spending so much money going to Mars? Gusev Crater on Mars (taken by the Mars Exploration Rover Spirit on Jan. 10, 2004. Water and Its Importance. Water and Living Organisms Water is the most important compound in living organisms. It makes up 70 – 95% of most organisms. Water & Life Chapter 3. SC.912.L Properties of Water that contribute to Earth’s suitability as an environment for life: 1. Cohesive behavior. 2. Ability to moderate temperature. Water and Life Properties of Water. Polarity 1.Draw a Molecule and Label the Charges 2. How do Water Molecules interact or affect one another?